I discovered Elke Schmitter’s ‘Mrs.Sartoris’ through Caroline’s (from Beauty is a Sleeping Cat) post on contemporary German women authors. When I read Caroline’s review of it, I decided that I had to read the book for German Literature Month. ‘Mrs.Sartoris’ is narrated by Margarethe, a forty-year old woman, who is the Mrs.Sartoris of the title. She is married to Ernst and has a teenage daughter, Daniela. The whole book has two story strands. 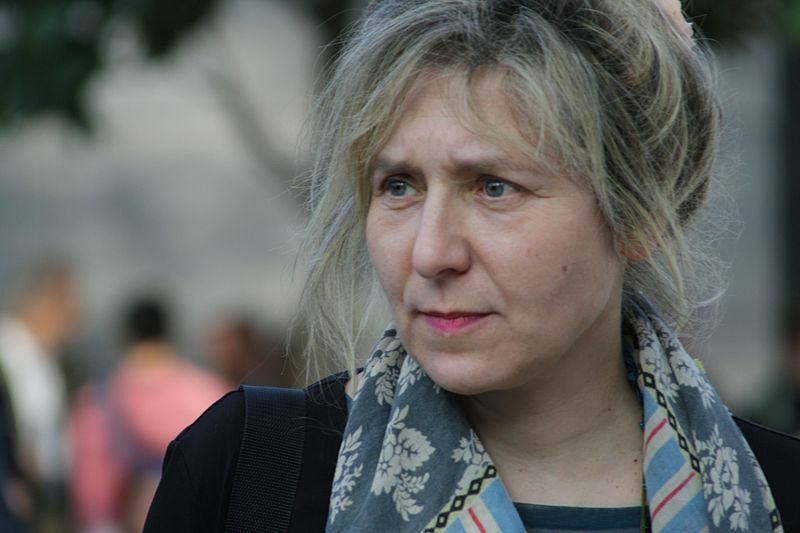 In the first of them, which starts the book, Margarethe talks about how one evening it was raining and she was driving and she saw a man in front of her trying to cross the road and deliberately hit him and killed him on the spot. The police are investigating the case, but because there are no eye witnesses, they are not able to make much progress. We don’t know the identity of the dead man, but from Margarethe’s description, it looks like there is a past story and our heroine had a strong reason for doing what she did. In the second strand, our heroine describes how whenever she goes out to meet her friends and comes back her husband checks her breath discreetly because he is worried about her drinking. To explain why, our heroine talks about her past, starting from her first love and how she fell in love with a young man who turned out to be from a rich family and how he broke her heart. She also describes how she met Ernst later and got married to him. There is a beautiful portrait of Irmi, her mother-in-law, who was one of my favourite characters in the book. She also talks about the troubled relationship she always had with her daughter Daniela, since Daniela’s birth, because Daniela always seems to look beyond the façade and see the real face of her mother. Margarethe talks about how, though she tolerated her life with Ernst, she didn’t really love him (though she loved Irmi) because of her memory of her first love and wondering what might have been. Then one day she meets a man at a music concert she performs in and there is an immediate spark which leads to an affair. Michael, her lover, gives her things that Ernst cannot and after a while, our heroine starts making long-term plans with him. Michael is very circumspect about it, though. Then one day, Margarethe tells Michael that they should leave their families, move to Venice and start life anew. Michael, after dithering a bit, agrees to it. Do Margarethe and Michael manage to get away from their families and start a new life? What about those who are left behind – the loyal Ernst, the loving Irmi and the troubled Daniela? What about Michael’s family? What about the second strand of the story in which our heroine kills someone deliberately? The answer to these questions and how the two strands get woven together in the end form the rest of the story. When we got engaged, Irmi had just turned fifty, and she dazzled me. She was a war widow, her only son had had one lower leg blown away in battle, her income could even be described as wretched – but she always looked as if she’d won the lottery and was just waiting for people she could share it with. The first time she saw me, she immediately embraced me and led us into the parlor for coffee s if I were the daughter of a queen. Ernst told me you are beautiful, she said as she cut into the cake, but he didn’t tell me just how beautiful you are! I totally fell in love with her. I wish she had a bigger part to play in the story. Ernst, Philip (Margarethe’s first love), Michael, Renate (Margarethe’s friend), Daniela all have their parts to play. Daniela’s part increases in importance towards the end of the story. I loved ‘Mrs.Sartoris’. I loved Schmitter’s elegant prose, I loved the even pace of the story, I loved the heroine and her thoughts and questions about life and I loved Irmi. This book is a perfect little gem. It is one of my favourite reads of the year. I can’t wait to read Elke Schmitter’s next book. I checked in Amazon and discovered one more book by her – ‘Leichte Verfehlungen’ (Minor Misdemeanours) – and one slated for release next year – ‘Veras Tochter’ (Vera’s Daughter). I hope both of them get translated into English. I will leave you with some of my favourite lines from the book. Daniela was made of feathers, light as a butterfly, with red-gold down for hair, eyes that were almost transparent, more of a delicate moth than a baby. I had always thought that poetry was not worth much because it was hopelessly exaggerated; now my reservations were reversed : I thought, if that’s all the poets have to say, it’s totally inadequate, a tepid half-representation of reality. We didn’t need things to keep us busy and I no longer had any idea how we spent our time; I remember our happiness, but I don’t remember the shape it took. Ernst wanted a girl, which surprised me a little; I thought all men wanted a son. I’m lucky with women, he said, looking happily at both me and Irmi, and his wish was granted. His life’s goal was to be comfortable, he was as transparent in that regard as a glass of water, and he only thought about people in any serious way if they troubled his comfort. The animals calmed me down, in particular the huge eyes of the cows, which observed me neutrally. I wished passionately that I was seventeen again; if I were as old as Daniela, I thought, or just a little older, this scene would have an innocent charm, because everyone believes a young girl is entranced by ruminant beasts; it’s somewhat laughable in a grown woman – you don’t stand there by a trampled field in a silk dress making yourself loved with lumps of sugar. The clock in here was never accurate, but Irmi felt that wasn’t the point, a kitchen clock was only there to make you feel comfortable and at home, and she was probably right. In the moment when I fetched a glass of tap water and sat down beside him, as if for a great debate, and looked at him in silence, in that moment I lost the chance to make a nothing out of all this something, and make the catastrophe simply go away. You can find other reviews of the book here. 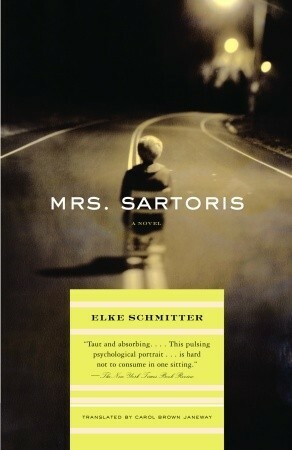 Have you read Elke Schmitter’s ‘Mrs.Sartoris’? What do you think about it? This sounds like a great read. I’m wary of reading books about affairs because, like you, I wonder why people don’t try to repair relationships or end one before starting the next. But this book sounds like it might be worth the time! Thanks for sharing. I’m glad you are enjoying German Lit Month! Thanks Lindsey! This was definitely a beautiful book inspite of the complex topic. Elke Schmitter’s prose was pitch-perfect – neither spare nor flowery – but a perfect balance of both. There was not a single superfluous word. It is a book I would like to read again – atleast parts of it. If you do get to read the book, I would love to hear your thoughts on it. Thanks Violet 🙂 Hope you get to read ‘Mrs.Sartoris’ and like it. I would love to hear your thoughts whenever you get to read it. Great review, Vishy. I’m so glad this worked. After the Rain debacle. The end is unexpected, didn’t you think? I thought she’d killed someone else. That was well done. I loved Irmi too. I think it said a lot of Mrs Sartoris that Irmi was he favourite person. It has such excellent passages. I did get the affair because I think she never got over her first love and that was sweltering and kept her from accepting the life she had. It’s uncanny that nobody ever noticed she wasn’t happy. Thanks Caroline 🙂 Thanks for recommending this book and reviewing it. I wouldn’t have discovered it otherwise. I found Elke Schmitter’s prose pitch perfect – it was neither spare nor rich but a perfect blend of both. I can’t remember the last time someone wrote like this. It was such a pleasure to read. The ending was definitely unexpected. I expected that the dead man was one of two other people – the obvious suspects 🙂 Yes, it is sad that Margarethe never got over her first love. It was sad the way Paul broke her heart. I was looking for other books by Elke Schmitter, because I want to read all of them now 🙂 I discovered only one more – ‘Leichte Verfehlungen’ (Minor Misdemeanours) – and it looks like that is not available in English translation. Also it looks like there is a new book of hers which is slated to be released next year – ‘Veras Tochter’ (Vera’s Daughter). Are there any other books written by Schmitter? Have you read ‘Minor Misdemeanours’? How is it? This is one lovely review, Vishy. I enjoy books that deal with life’s big choices. The “Should I go or should I stay” question had always fascinated me. I remember a short story by Alice Munro called “The Children Stay” that deals with a similar dilemma and I liked it even if the end was a little odd. I guess I’m always looking for that happily ever after. Thanks Delia! Glad to know that you liked the review. ‘Should I go or should I stay’ is definitely a very interesting question. I think you will enjoy the way Elke Schmitter’s book explores that question. Thanks for telling me about Alice Munro’s short story ‘The Children Stay’. I will look for it. Like a Rolls Royce or a Merc – that’s a great description 🙂 The extracts sound really good. Another writer I’d never heard of, and it’s great to hear you enjoyed the book so much, Vishy. I’ll look it up. Thanks Andrew 🙂 Glad to know that you liked the extracts. Hope you get to read the book and like it. Wonderful review Vishy and I’m impressed that there wasn’t one superfluous word. That’s amazing. Will keep an eye out for this book. Thanks TBM 🙂 Elke Schmitter’s prose was really perfect. I hope you get to read it and like it. I will look forward to hearing your thoughts on it.